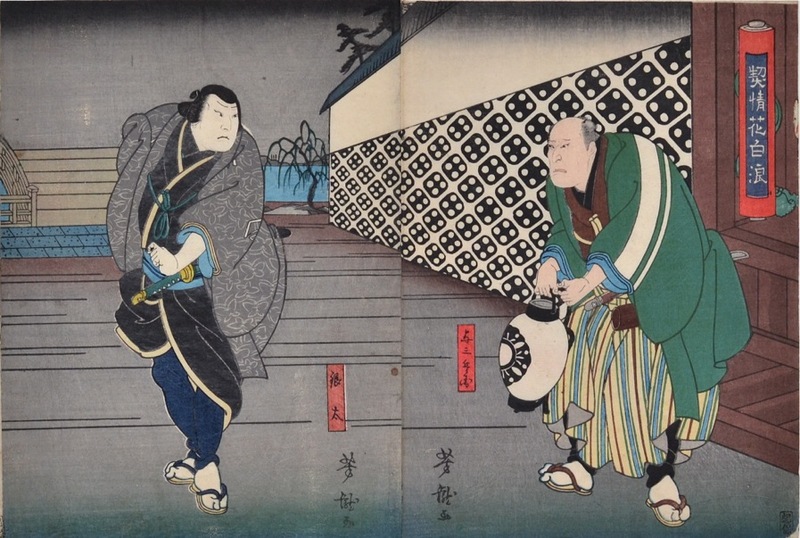 Utagawa Yoshitaki (ca 1841 - 1899) Kataoka Ichizo I as Yosabei and Onoe Tamizo II as Ginta from the play Keisei Hana no Shiranami, early 1861. Deluxe Chuban Diptych. A very interesting diptych by Yoshitaki, the last of the great actor printmakers of Osaka. This piece displays a striking use of western perspective in the strangely dice-patterned loggia that carves out the space in the middle of the two sheets. This unusual perspective for an Osaka print is enhanced by the bold pattern and the large foreground in which the two nicely executed figures are arranged. Separate sheets, colour and impression are fine, condition very good.